LoRa-based sensors track cattle wellbeing and location in real time. Semtech Corporation announced that lar.tech, a Russian smart technology innovator and member of the LoRa Alliance™, has created an Internet of Things (IoT) cattle monitoring solution leveraging Semtech’s LoRa® devices and technology. The LoRa-enabled GPS tracker and biometric sensor monitor the animals’ vitals and whether animals have strayed from their designated areas. 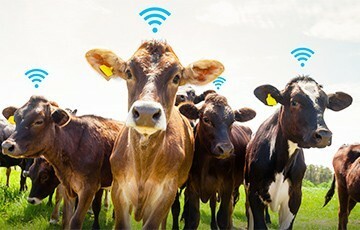 “IoT solutions built on LoRa Technology represent an important emerging trend in ranching and smart agriculture,” said Alexander Trubitsin, Head of Development at lar.tech. The lar.tech LoRa-based device is tagged on a cow’s ear and wirelessly transmits real-time data on the cow’s location, reducing the chances of wandering or theft. Additionally, the tag monitors animal motion, letting the rancher know if the animal is over or underactive, as well as observes the animal’s body temperature and detects estrus. Applications continuously scan the data, and notify ranchers immediately in the event of an abnormality. “Smart agriculture solutions are benefiting from LoRa Technology which is a proven IoT choice for ranchers around the world,” said Vivek Mohan, Director of IoT in Semtech’s Wireless and Sensing Products Group.